Marwari Pyaaz Ka Achaar & Olive Oil Tasting - Oliveitup! The Consortium of Guarantee of Quality Extra Virgin Olive Oil (EVC) on successful completion of one year, has launched a promotional campaign called Oliveitup for the promotion of premium olive oil in India. The consortium aims at creating awareness and knowledge of extra virgin olive oil (EVOO), while ensuring quality. As part of the awareness campaign, the consortium conducts press conferences, advertising campaigns, training sessions and media tours. A press conference and an olive oil tasting session and a cooking demo by Chef Vicky Ratnani was held at The Oberoi, Bangalore. Italian expert Mr. Michele Labarile, gave an insight into tasting and recognizing quality of EVOO. We ate some delicious Root Vegetable Tikki and Peach and Bell pepper Chutney after Chef's demo of the same. Olive oil is extracted from freshly picked olives and cold pressed in controlled conditions, without chemical treatment, hence retaining all the essential fats. The light green color is due to the chlorophyll. Olive pomace oil is a refined version of olive oil, which does not provide the same benefits. Though Olive oil is regarded as one of the healthiest oils and is slowly gaining entry into Indian kitchens, it is still regarded as an oil which is not suitable for Indian cooking. While we are open to the idea of using olive oil in salads, pastas and the kind, we are yet to accept it in our everyday traditional cooking. We are used to cooking with either flavorless oils like sunflower, rice bran or canola while the usage of oil like mustard, coconut, sesame and groundnut is restricted to certain dishes or cultures only. With us Indians having a food culture with generous usage of fat and sugar, the rates of us being affected with lifestyle diseases such as high blood pressure, diabetes, obesity and cardiac problems are very high. Small wonder we as a nation top the charts when it comes to cardiac problems and diabetes. It was very interesting to note that more than the quantity of fat, its the quality of fat which gives rise to undesirable effects. Ms.Ishi Khosla, one of India's renowned nutritionists gave an extremely insightful presentation on the health benefits of olive oil. The below information is from her presentation. She described the French and Spanish paradox which highlights low incidence of cardio vascular diseases in the French population despite the high intake of saturated fats, which are proven to be harmful for health. The population here consumed olive oil extensively which gave rise to the theory of importance of quality of fats over quantity. The people here consumed significantly more of Mono Unsaturated Fatty Acids (MUFA) than Saturated Fatty Acids (SFA). Now in a nutshell, MUFA is good fat, SFA is bad and then there is PUFA (Polyunsaturated Fatty Acids) and then there are transfats which are the big bad guys, you want to interact with minimally. They are the good, bad and the ugly. All oils contain all of these fats and are classified according to the high presence of the fats. For example, Olive oil has very high presence of MUFA, hence it falls under the category of MUFA. But that doesn't mean we have to totally eliminate all the other kinds of fat from our diet. SFAs are ghee, butter, lard and coconut(!!) . According to National Cholesterol Education Programme, This should constitute less than 10% of your total energy intake in a day. MUFAs are Olive oil, canola, rice bran, mustard, groundnut and sesame (yes!) . This should be 10-12% of total energy intake. PUFA are safflower, kardi, corn and to my surprise sunflower and soybean oil too. This should be less than 7% of total energy. Trans fats are vanaspati - stay away!!! This goes very generously into baked goods like our much loved puffs. High MUFA and low SFA content, hence lowering risk of heart diseases. Has high amount of essential fats and nutrients as its cold pressed. Its cold pressed, retaining all the goodness as opposed to refined oils which are extracted at high temperatures. Refined oils produce hexane, a carcinogenic substance during the process of extraction. High heat resistance, high smoking point. The high smoking point makes it ideal for frying food. All said, it would not be wrong to say, any oil, even a healthy one, is still oil, hence beneficial only when consumed moderately. Coming to the Marwari Pyaaz Ka Achaar, Sneha, a good friend of mine, has been using EVOO in her everyday traditional Marwari cooking since quite some time. I have eaten (alright, overeaten) some superb Marwari fare at her place quite a number of times. I wanted to know from her, if there was any particular traditional recipe she loves using EVOO in. A dish which normally is made with a lot of oil. 'Pyaaz Ka Achaar' - came the instant reply and the recipe. Err.. how much of all the spices? She very graciously invited me home (and I jumped at the chance!) for breakfast followed by a session of making the Achaar. After a scrumptious breakfast including Makai Ka Dalia (oh, I LOVE that porridge), we were all set to make the pickle. Tongue tickling Pyaaz ka Achaar is sliced onion marinated in oil and spices like kalonji, jeera, saunf, chilli powder and salt. The onions are not washed as it introduces water content in the pickle. Traditionally a pickle commonly stored in Marwari homes, its specially made for long journeys or while traveling. This pickle can be made in absolutely no time at all and keeps well at room temperature for 2-3 days. Another interesting thing to note here is the remnant oil in the pickle can be topped with more sliced onion and spices if needed. There you get more pickle with about the same oil! And the taste is just too good! Here is how Sneha made this. Procedure: DO NOT wash the onion. Just remove the outer few layers of the peel. Slice them thin. This made 2 cups of sliced onion. Place the sliced onion in a bowl. The bowl should be big enough to easily mix the pickle in. Put the salt, red chilli powder, fennel powder, mustard powder and hing on top of the sliced onion. Heat half the oil, pour it on the sliced onion. Check how much more you would need to mix in the sliced onions. Heat the rest of the oil or the needed quantity. Add the mustard, jeera and kalonji. Pour it on the onion mixture. Mix well. That's it!! You could also just put the said spices on the sliced onion, heat ALL the oil with the tempering and pour it on the onion. Only doing it in 2 additions helps if you would want to use less or more oil. The onion will also shrink by the next day. So you could use less oil if you so plan to eat it the next day or the next. You could also try using baby onions. You could eat the pickle right away, but the flavors get enhanced by the day. And you could always top up with more sliced onion and spices once the entire pickle is over. Do spoon out the dry spices which tend to settle at the bottom when you eat. We ate the pickle with khakra and it was fantastic! It tastes even better the next day. Thanks Sneha for sharing this traditional family recipe, made healthier with the use of EVOO. I hope you know me. You must, as I am one of those people who call out to you ever so often, albeit in different contexts. As in 'Goddddhhh!!! This tastes so...gooood!!!!'' and sometimes 'GAWD!!!! Did this have to happen NOW?? - when there is a power cut when I am baking. I am also the same Mom who very often says, 'Godddd!! WHAT HAVE YOU DONE HERE?'' to my kids, but lets leave that out for now as its out of context here. Hubby too often calls out to you as in 'God!! Are you gonna bake AGAIN??? '- this to me of course. If you have ever heard the resounding nnnn... of a groan, it was me when I stood on my bathroom scales - you know the treacherous machine betrayed me yet again. I am also one of your devotees who eats every small bit of the prasad I get. Small introduction for you to recognize me in this ocean of people, but I hope this will suffice as you are God and you will instantly know, that its ME!!! Believe me, I really, really do count my blessings every day, cross my heart and sacrifice that last slice of coffee gateaux and hope to die. But God, there are some things which I guess also deserve your undivided and urgent attention. Small things, but in my humble opinion, very very important. Without taking much of your time, I shall sum them up quickly. For beginners, can you please redefine a balanced diet as enough appetizers, a main course and a dessert instead of adequate carbohydrates, proteins, fiber etc etc? Yaawn! I know you are God, but I hope you have a heart too? Have a heart!! Boring salads should actually make us gain weight, hence to be treated as a rare indulgence and to be eaten in small quantities. For weight loss and good health, dietitians should prescribe a high fat, high sugar, carbs rich diet. Am sure you can make that work God!! Remember you are GOD!!! Gorging on all those greasy fries, buttery cookies and cakes, should actually transfer the shine of the fat onto the face, make the skin glow I mean. Please say yes! I will chuck that warm lemon water and honey. Stat! Please seriously consider making chewing the most intensive workout possible, burning calories like no other work out can. I promise, I will NEVER miss a workout. Shouldn't every grocery store in India have a baking aisle? Aaaw, God, don't enough of us bake here now and so passionately at that ?? Of course you may not have given much thought to these things, but a baking obsessed, sweet-toothed, weight watching (see, so many adjectives!) foodie's life can be really tough. I have so much more to say ... sigh! But I know other important matters such as global warming and world peace command your immediate attention. So let me stop here today and hope you 'process' my request. Amen! Its been raining mangoes everywhere, supermarkets, homes and our food blogs of course! The king of fruit has cast his spell on me too and I am can't be immune to his charms, though I try hard. Eating the luscious fruit as is, is the best way I can think of relishing it. A few pieces of the fruit make the perfect dessert and snack, desserts with mango though not a bad idea. Summer has its effects on me, the unflattering and the most noticeable one being my lethargy and the consequent - you said it - tipping of the weighing scales, not entirely in my favor. For the umpteenth time, I wonder, why can't tasty food actually accelerate your BMR? Why should it be so painful and slow to shed the kilos but a snap and a little(??) lethargy to gain them back? Sigh, sigh!! But then, a dessert with mangoes it has to be, before the season zooms past. A low fat one is even better. And easy ones with minimal effort (and distributed effort at that) are perfect on days when I feel lazy, but a dessert is such a welcome thought. Shrikhand is one dessert I immensely enjoy, for its creaminess, the subtle tang of the yogurt and the flavor of cardamom. I like it even more as it does not have me thinking how much it would contribute to my greedy bathroom scales. This Maharashtrian sweet dish is basically made of yogurt, drained and thickened, flavored with cardamom and saffron and sometimes fruit puree added for a distinct flavor. Nuts such as chiroli, slivered pistachios or almonds add crunch, a wonderful contrast to the creaminess of the dessert. The only time consuming part of this dessert is draining the yogurt, but you could use packaged thick yogurt to speed up the process. I normally drain the yogurt in the fridge itself as I prefer the yogurt really well drained, yet without too much of tang. Shrikhand is not really shrikhand to me, unless it has a predominant cardamom flavor, so I am generous while adding this. 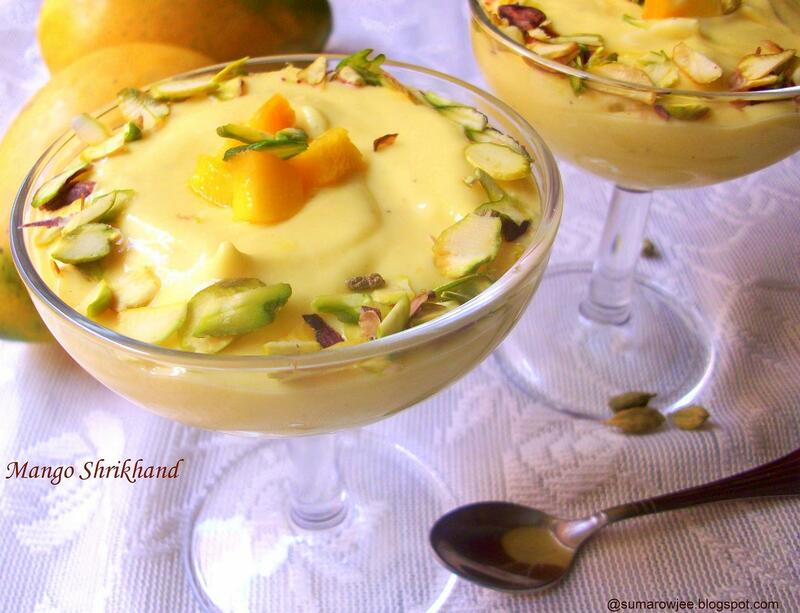 A shrikhand made with mango puree or Aamrakhand is very popular during the mango season. As is aamras in most Indian households, this being made every other day to go with rotis and sometimes puris on a more indulgent day. Shrikhand is also made with strawberries or even chopped mixed fruit which I plan to try sometime soon. For now, before the mangoes bid adieu, its Mango Shrikhand. Well, this time around, it was breakfast at Café Coffee Day for food bloggers. This was for the launch of their new breakfast menu, aptly named as "Rise And Shine' at The Square. It was an honor to be invited by Mr. Ramachander Raman, Head, Food & Beverage, Café Coffee Day. Café Coffee Day being the first in India to introduce the concept of coffee bars in India, needs no introduction at all. Elegant and chic, The Square on Vittal Mallya Road, prides itself on being India’s First Single Origin Coffee Café. The cool, cloudy morning set the perfect weather for breakfast at the Café and in the company of blogger friends, Deepthi, Irin, Madhuri and Shubhada. A morning to look forward to indeed! I reached a bit late having gone to the other Coffee Day Outlet nearby, how like me! And goes to show how necessary a skill like driving can be! Am lost for directions when I take public transport and land up in situations like this when I do. Just as well, a bit of exercise before the most important meal of the day helps whet the appetite as well as burn some calories before the indulgence. It was a really enjoyable walk to The Square in that weather only Bangaloreans get to enjoy every now and then. As I walked into the Cafe, Swaha and Nidhi of Madison PR had me seated at a table. The sun drenched bright interiors are an instant pick up, making you want to soak up the sunshine and bask in it. Perfect ambiance for that breakfast, the combined effects of good grub, fresh air and sunshine can seldom make a start to the day less than perfect. Not to mention the very welcome aroma of coffee as you step in. Can anticipation get any better for a coffee crazy foodie? Mr. Ramachander personally took time to help us get acquainted with the new range of single origin coffees and some more about CCD. In the meantime, I was handed over the bright menu card to order my breakfast. I could hardly object as I very well know, a growling tummy is not extremely conducive to any kind of reception of information, even if it pertains to food! 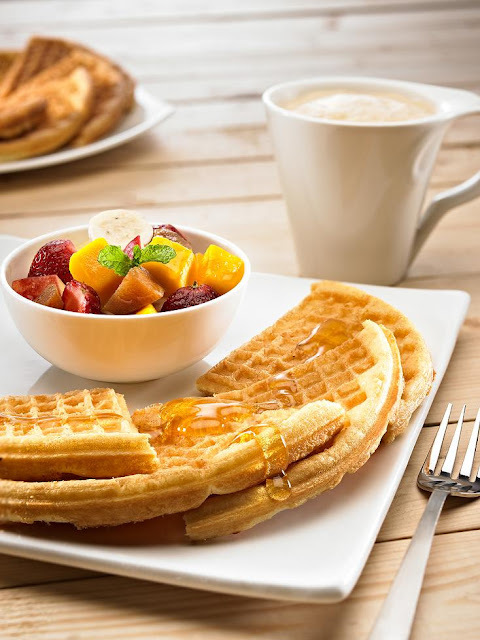 The menu has pre-fixed combo options such as muffin or croissant, muesli and fruit bowl, warm Belgian waffles with choice of sauce, choice of eggs, potatoes and toast, egg whites with fruit bowl and yogurt for the health conscious. Of course all of these served with fruit bowl and hot Cappuccino or Latte. 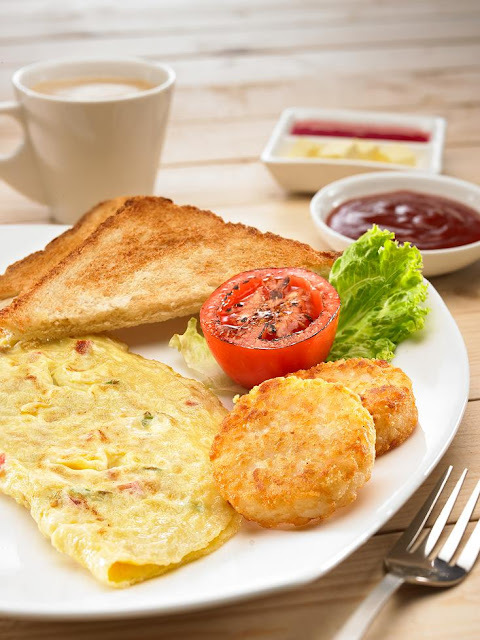 The A La Carte menu has options of choice of egg with grilled tomato and toast, waffles with choice of sauce, Swiss muesli with milk. Yummy side companions include hash browns, potato wedges, fruit juice, fruit bowl and yogurt. I opted for hash browns, toast, grilled tomato and a cappuccino. While the order was taken by the well trained staff, Mr.Ramachander put me at ease while he explained about CCD, the new breakfast menu and the coffee. Single origin coffee refers to coffee from a single geographical origin as in from one particular farm or a specific collection of beans from a country. Brews from around the world from Ethiopia, Colombia, Peru, Costa Rica are served at The Square. Indian single origin coffee from the Himalayas, Kathlekan and Rajgiri are also on the menu. I thoroughly enjoyed the crispy and delicious hash browns and the eggs. I also realized its difficult to sit across a table, eat graciously and and actually converse sense when your mouth is full and your taste buds demand full attention! I unashamedly took a big bite of the waffles drenched in chocolate sauce from Madhuri's platter, dug into Shubhada's croissant, muesli and fruit bowl. Oh yes, the waffles were good, so were the potato wedges, very very crisp and very delicious. The strawberry jam which came with the croissants was also good, though a bit on the sweeter side. The incorrigible foodies that we are, we requested for more potato wedges. I don't really have to tell you how fast good food disappears on a cold day, even faster if it happens to be hot and crisp! 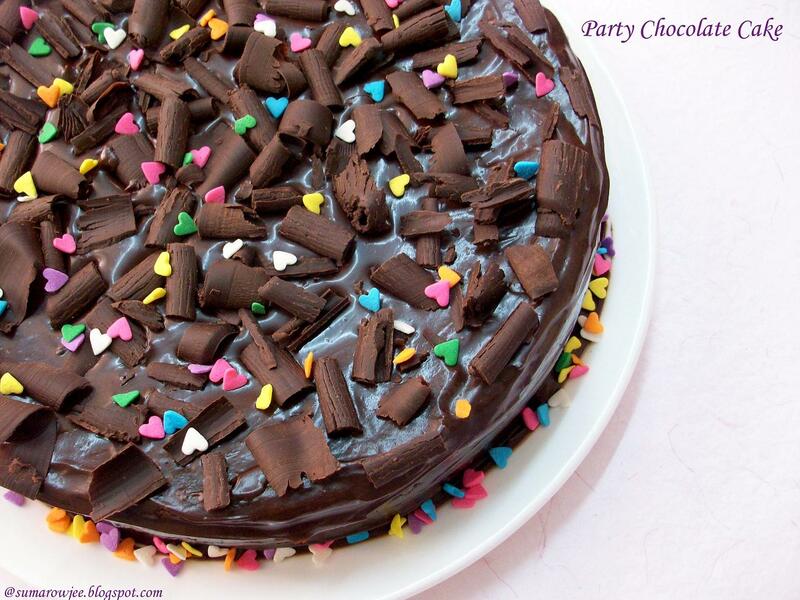 We also got some chocolaty chocolate cake as CCD even had a cake ready for the birthday girl Madhuri! Clockwise from left, Irin, Deepthi, Gauri and me. Madhuri cutting her birthday cake, Shubhada and Omana, Head of Beverages, CCD Lounge and CCD Square. 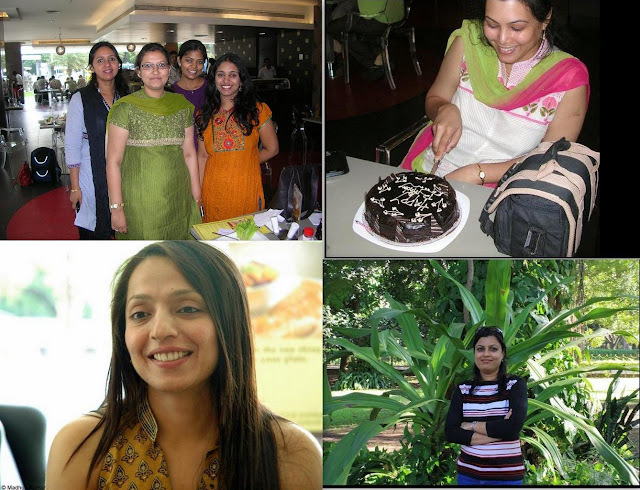 Pictures from Madhuri and Shubhada, thanks gurls! I got a taste of the Ethiopian coffee which was really good, though I could not get to savor a full mug at leisure. Well, a reason to visit CCD I would say! Though the experience was great as a whole, I did wish they had more options on the menu, the croissants though soft, could have been more flaky with the taste of butter coming through. For a better gourmet experience, the bread can definitely be better in flavor and texture with more enticing options here too. Service was not very efficient, considering the few guests at that hour. Super efficient service would be very much appreciated by the office-going customers. 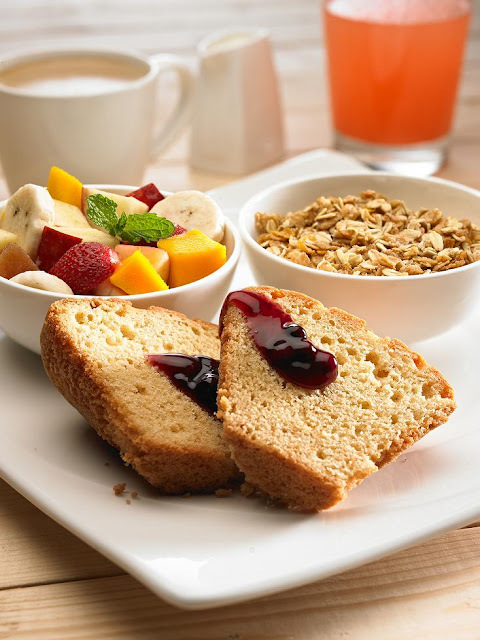 If you are in the vicinity of Vittal Mallya Road and looking for a leisurely breakfast replete with an array of coffees, you must try The Square for sure. And while you are there, do not miss the Ethiopian coffee, waffles, potato wedges and the hash browns. And yes, this I personally feel is more enjoyable as a leisurely weekend breakfast rather than a weekday one. If you had to hurry through the coffee and the breakfast, you would then not be able to fully enjoy the beauty of the place. The ambiance is a huge plus in favor of The Square, without which the experience would be incomplete and mission not quite accomplished! And I highly recommend a stroll along the sidewalks both before and after your breakfast, it truly is a pleasure! Talk about location advantage! It was quite late by the time we finished breakfast and I had to rush back to my daughter who would have arrived from school. Given a chance, I would have loved to browse through their merchandise of coffee mugs, coffee powder and cookies. CCD gifted us a box of coffee as well as a coffee maker, a souvenir for me to remember that lovely morning at The Square. Thanks for having us over Mr.Ramachander and here's wishing CCD all the very best! Weekends are times I like to get up late, hope that the kids wake up at least half an hour after I do. That sacrosanct half an hour gives me time to savor my morning cuppa in leisure. Yes, I really like to take my time over my huge mug of strong filter coffee. A hurried cup or drinking my coffee with the kids hovering around, threatening to spill the hot liquid, really takes the fun out of it. My idea of an ideal weekend is waking up late, sip my coffee leisurely, go for a walk, come back home to the smell of freshly cooked hearty breakfast. Later during the day, pop a bake in the oven, curl up with a good book in my hand, some good music playing in the background, the kids hanging around but peacefully, they will not fight, do their assignments themselves. Sigh! This of course is wishful thinking...What's you idea of an ideal weekend? Oh yes, we have Darshini's or the self service South Indian style hotels, one or two in every street and cross, no kidding, but no thanks, I would rather not eat a greasy masala dosa first thing in the morning. Come to think of it, I don't even want to make an effort to get dressed to go out. So home-made breakfast it has to be. But then I should at least make an effort to not make something totally uninspiring either. Hubby will survive that (see how we take them for granted!) , but the kids? Aaaw, gotta make something indulgent for them, once in a while at least. If not all my other sterling qualities, they have surely (and thankfully!) inherited my sweet tooth. 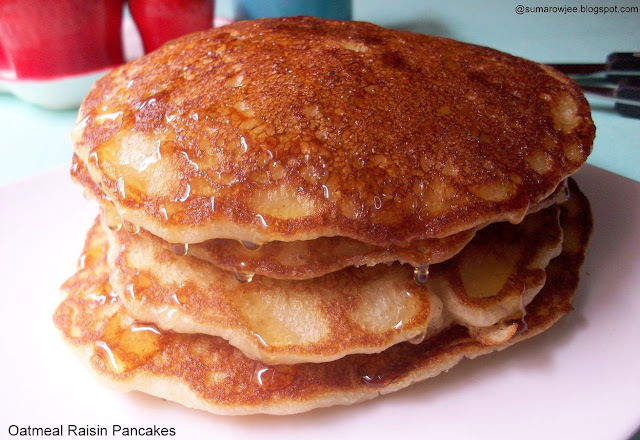 Pancakes on the griddle will surely have them seated on the table much before the pancakes go on the waiting plates. Honey and chocolate sauce will already be well on their way into the tummies with me playing spoilsport by whisking away these bottles. As my little angel(?) turned 4, it was time for a cake again. I have to and don't have to think hard for her birthday cake. Have to think because she is choosy about what she eats, when in doubt, will sniff food and decide if she will eat it or not. And she does not like nuts in everything, Ferrero Rocher chocolates, peanut butter and chikki some exceptions to this rule. I don't have to think much as she invariably wants a chocolate cake. So it has to be a different chocolate cake for each birthday, God and you folks must help me! Welcome showers are here, cooling the city, relief! The fans and ACs finally get some rest and I am actually enjoying my morning walk, with or without the music playing from the radio on my phone. With us getting an elliptical cross trainer very soon, I decided this morning, that a walk outdoors is a real pleasure, the trainer coming home would not make me stop doing this altogether. Its a pleasure to watch the cloudy sky, even bigger a pleasure is the lingering smell of the wet earth after the showers. Along with them, the monsoons bring the urge to treat and tickle the taste buds with hot and spicy food. When it pours, you reach out for the coffee mugs. Along side the steaming cuppa, a hot savory treat not totally unwelcome...Crisp treats, bhajias, pakoras, roasted or steamed peanuts, warm and spicy corn on the cob...And of course a serving of warm dessert. I love to eat spicy food but unfortunately hubby does not like his food very spicy. Sensitive tummy, thanks to years of eating out. Hence our everyday meals are quite low on spice and heat. I so look forward to eat the food my mother sends my way often as it really makes my taste buds come alive. Ahem.. hubby wants to forewarned when the food is coming in from my Mom's place as he can take an antacid before he eats. Or even when its Bisi Bele Bhaat for lunch. No exaggeration this! My mother makes special effort to go easy on spices when we are to eat at their place. I groan in protest, Mom wants to please the son-in-law more than the daughter! Predictably, the pickles at home are made and stored at home exclusively for me and of late my daughter, who has started to relish them hugely. Yaaayy!! While eating out, I have the luxury of eating spicy food only when we order individual servings as in chaat, mine is extra spicy, hubby and kids opt for regular or less spicy. Sometimes, I prepare side dishes like Spicy Green Chilli Raitha which is only for yours truly to relish. And very rarely I go the whole hog and dish up really spicy snacks or main course which I fully know, only I will eat. I sound greedy don't I? Well, I am guilty of being greedy, for food pleasures! On this rainy day, I was looking for an easy, non-deep fried spicy snack recipe. Search lead me to Sanjeev Kapoor's Low Calorie Vegetarian Book. 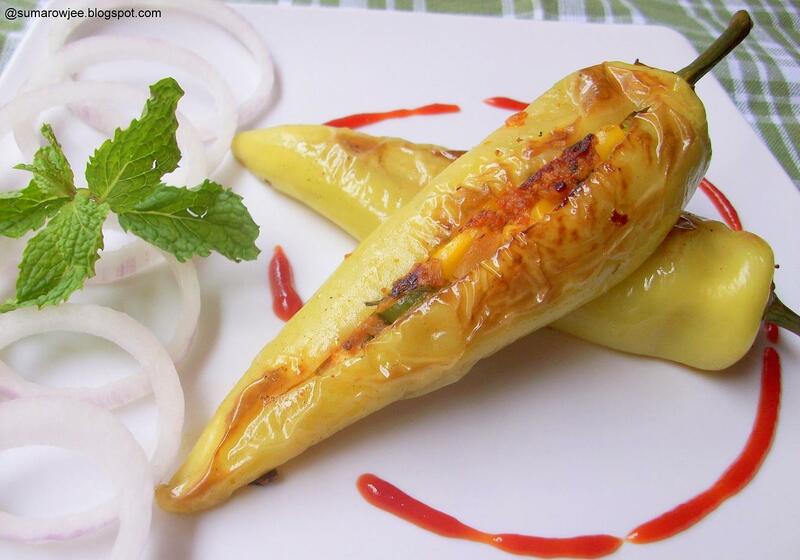 Chillies stuffed with vegetables and spices and oven baked. Perfect!!! I had to try these out! The original recipe uses chopped mushrooms and grated processed cheese in the filling. I used crumbled cottage cheese and boiled sweet corn, threw in some chaat masala, some chopped green chillies and stepped up on the spices, roasted the stuffed chillies on a hot griddle... Fiery and tasty! Can probably stuff the chillies ahead and refrigerate them, cook when needed. Gawd! I really don't enjoy slaving and deep frying in batches when there is a crowd. How about you? A simple and easy dish, tweak it to suit your taste. But be warned, this will not be for the faint-hearted! !